Lucy Van Pelt loves the beautiful sound of clinking nickels. She wants real estate for Christmas. Snoopy challenges passersby to find the true meaning of Christmas by winning “money, money, money” in his “spectacular super colossal neighborhood Christmas lights and display contest.” For her part, Sally Brown forgoes her lengthy list of gifts, asking Santa instead for cash — tens and twenties. You know, to make things easy. All she wants is what she has coming to her. All she wants is her fair share. This doesn’t help Charlie Brown’s depression. Nor do the grandiose material expressions of the holiday season —beginning as soon as our Halloween candy bowl runneth empty — help ours if we think too long about them. So begins A Charlie Brown Christmas, the boy’s journey from despondency to hope. And despite the TV special airing in 1965, there is some relevance all these years later. Some of us, like Charlie, feel like our basic understanding of the season — giving, receiving, relative levels of joy — lies in contrast to popular culture’s rendition of it. Some of us, like Lucy, have embraced the latter rather than bemoan it — she prefers pink aluminum trees, and she’s not upset by it. Some of us are Snoopy opportunists. 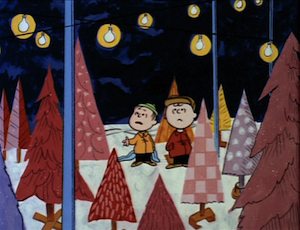 And plenty of us, to be sure, are like Linus, whose purist perspective can’t be fazed by all the noise. The resulting emotional schizophrenia is staggering, if predictable. There’s loneliness and companionship, joy and despair, truth-seeking and blithe celebration, all during what’s marketed to be the most wonderful time of the year. Your interpretation of the season begets your holiday spirit, whatever version it may be — bah humbug and good tidings. It’s little surprise then that Charlie Brown’s soundtrack, as well as our own, is something just as introspective and shifting. Something like jazz. 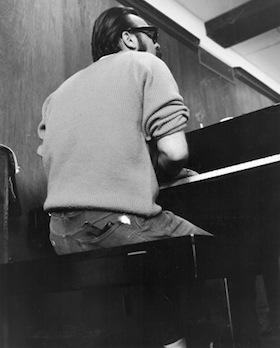 Vince Guaraldi’s originally composed arrangements of mostly traditional music now reside firmly within the Christmas consciousness, among the cadre of traditions that will forever define the season. His open-ended meditations and syncopated spirit create whatever mood you need them to for your personal holiday, and they feel all the more universal for it. This somewhat betrays their more traditional source material, where holiday music is the meaning of Christmas as we’re expected to know it. It can be splendid, but it’s simple, straightforward, explicitly told. It may well serve Linus, but it’s only background music for Lucy and Snoopy. And of all the Charlie Browns in the world, it doesn’t account for the Charlie Browniest. Something like Guaraldi’s “O Tannenbaum,” though, does. Opening with a lonely stare out a lonely window over solo piano, it watches as happy couples scamper down the sidewalk, new tree in tow. But the piano’s tempo quickly picks up, drum brushes sweeping in behind it, upright bass bouncing through the door, and things aren’t so alone all of a sudden. It becomes cocktails with company. And at its close when the tempo leaves, the company remains. Quiet, warm and content. More contemplative moments — the six-minute instrumental of “Christmas Time is Here,” “What Child Is This,” the enchanting “My Little Drum” — wander a bit more freely, more flexibly in the headspace. “Skating” falling like snow and “Christmas is Coming,” a yuletide crescendo of energy, are more palpable, more visceral maybe. In “Hark! The Herald Angels Sing,” crisp with purity and innocence, Guaraldi employed a children’s choir, his Hammond organ thrumming underfoot, to declutter the tradition, remove any contaminated or confusing element, and to humbly proffer meaning. They struggle to the hit the high note in the end, but they sure do try, Charlie Brown. This is all pretty heavy stuff for what’s basically a kid’s show. But then, that’s largely why it reached us to begin with, long before we really knew what either the show or the songs were saying or doing. In May 2012, when the Library of Congress included the Vince Guaraldi Trio’s A Charlie Brown Christmas in its selections for the National Recording Registry, it said, “A Charlie Brown Christmas introduced jazz to millions of listeners.” That feels right. School-age children were able to access jazz because it was couched in cartoon and Christmas. Like the Christmas special itself, Guaraldi’s compositions reside beneath the veil of tradition. Shroud removed, you find in each something much deeper.